What girl doesn't like a good pampering? One of the best and cheapest ways to achieve pampering at home is through sugar scrubs! Oh my heavenly happiness, nothing says a Mommy's night off like a sugar scrub and an at home pedicure. My Sweet Sugar recently sent me a sample of their lemon/lavender scrub. First let me give you background on why I LOVE this product. All herbs that are in the scrubs come directly from the owners garden (Nature at it's finest). Courtney, owner of My Sweet Sugar started making scrubs while pregnant as a natural way to combat stretch marks. I'm sure every Mom can relate to the new look of stretch marks. I remember thinking "Oh my gosh these marks are huge!" Even though my stretch marks didn't go away, I'm proud of my Mommy lines. :) Although this product doesn't cure stretch marks, the scrubs definitely assist in exfoliating skin. All the scrubs will leave your skin feeling soft and rejuvenated. Now onto the review! While opening the scrub I was filled with the sweet aroma of lavender and lemon. What a fantastic combination! Seriously, I stopped everything to try this scrub! After using the product my hands had a silky soft texture. Oh lala! The hubby was even impressed ;) The scrub had the right mixture of sugar, herbs and oil. I enjoyed the wooden scoop, which gave the perfect amount of sugar scrub to my skin. If you are looking for a good gift under $15 you should definitely check out these scrubs! Special thanks to our wonderful sponsor My Sweet Sugar. The giveaway will have FIVE winners! Woo-hoo! Each winner will receive one sugar scrub in honor of Breast Cancer Awareness! Make sure to read this post on ways to volunteer and get involved with Breast Cancer support and awareness! The product will come from the sponsor My Sweet Sugar. Remember to read the terms and conditions below! 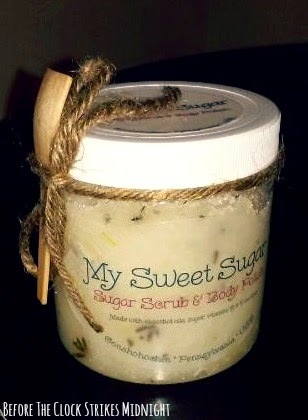 The five winners will each receive (1) Sugar Scrub from My Sweet Sugar. Anyone wanting to enter must live in the United States. Refer to the giveaway for details on the opening and closing dates. The winner is chosen randomly and will be announced two days after the giveaway closes. I was not paid to write or host this giveaway, however I did receive a free sample of My Sweet Sugar Scrubs. All thoughts and opinions are my own. Thank you Tiffany for the lovely review! I am glad you love the scrub as much as I do and hope others will as well! Happy to support such a great cause! Thanks Courtney! So glad we have the opportunity to work together for raising awareness about Breast Cancer. I love sugar scrubs! I need the exfoliation especially during the winter months which are just around the corner. CONNIE SOWARDS commenting: My favorite scent for scrubs is Lavender so I think I would like the Lavender/Lemon scrub. Thanks for stopping by to share this week!! My favorite scent for sugar scrubs is vanilla. I like anything that smells sweet.